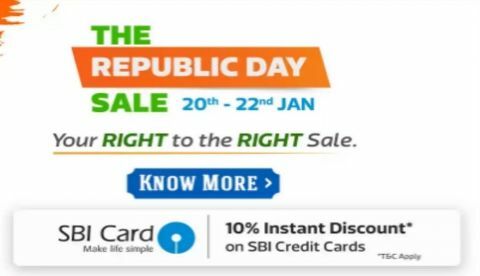 The Flipkart Republic Day sale is live now and will run till January 23. We have listed down some good deals that the platform has on TV’s, which are from brands like Samsung, Mi, iFFALCON and more. The Amazon and Flipkart first big sale of the year 2019 has kicked off on January 20. The Flipkart Republic Day sale is featuring pretty decent deals on TV. Besides regular deals and offers, the e-commerce platform has also collaborated with SBI bank and offering up to 10% instant discount to those who will make payment through the bank’s debit or credit card. The offer is also valid on EMI transactions as well. So let’s begin with taking a look at some of the deals that we have found on the platform on the sale day 2. The iFFALCON 55-inch Certified Android TV offers a resolution of 3840 x 2160 pixels. The TV features a built-in Wi-Fi that lets you access apps like Netflix, Youtube and more. It also has a Google voice search feature, which makes it easier for you to find content via voice command. This smart TV is available during the sale for Rs 37,999 down from its earlier price of Rs 43,999. Check out the deal here. The LG 43-inch UHD TV offers four times better resolution than the full HD TV. As it is a smart TV, one will have access to download and watch content from apps like Netflix. During the sale, the TV is available at a discounted price of Rs 47,999. Check out the deal here. The Vu 43-inch Official Android TV is also up for sale and available on the platform with a discount of Rs 20,000. You can grab this TV for now at Rs 29,999. If you have an SBI card then you can also get an extra 10% discount on your purchase. Check out the deal here. The Thomson B9 Pro 40-inch Full HD Smart TV gives you access to a wide range of apps such as Netflix, Youtube, Hotstar and more. The TV is available at a discounted price of Rs 17,499 on the sale. Check out the deal here. The Samsung 49-inch Smart TV offers a resolution of 1080 x 1920 pixels. The TV is available on a discounted price of Rs 59,800 during the sale. You can also get an extra 10% discount on your purchase if you will make payment through an SBI card. Check out the deal here.